Apartment T2 holiday , with a fantastic view over the sea , has a terrace of 50 m2 with barbecue , overlooking the beach Aveyros in Albufeira ( ALGARVE ) , is fully equipped with seating for 4/6 persons , located in condominium in first line of sea. 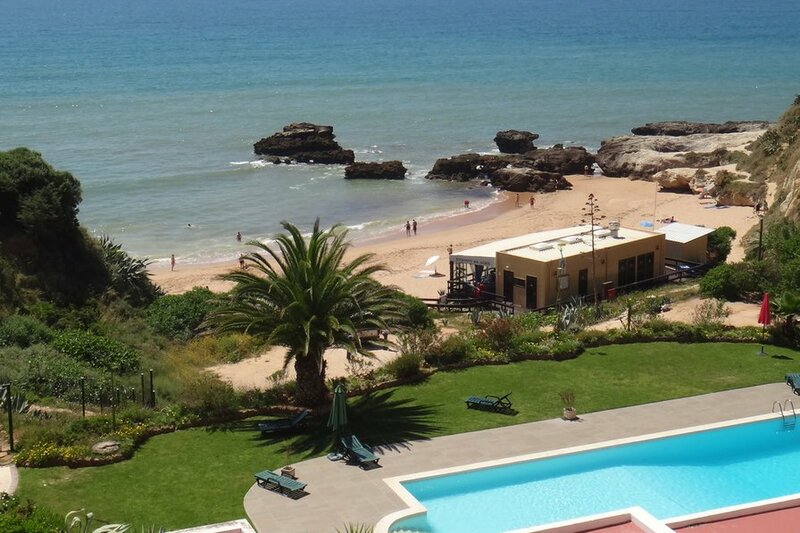 Very quiet and a few meters from the most famous nightlife area of Albufeira ( Oura ) , ideal for a dream holiday at home . ( WI - FI ) internet . Bathed by the Atlantic Ocean , Albufeira is considered the tourism capital of Portugal . Located in central Algarve , Albufeira boasts a distinctly Mediterranean climate , mild temperatures , both air and sea water , which enables it to enjoy its extensive golden beaches all year , in exceptional atmosphere that allows practice of several sports activities , as well as from the discovery of its important historical and cultural heritage . Exceptional place to enjoy a holiday in peace and security , Albufeira offers several alternative leisure environments and landscapes full of contrast , where you can savor the delights of a rich and varied cuisine and discover the hospitality of its people . In the vicinity of the condominium there is nightlife and Aquatica, the golf courses at a distance of less than 2000 meters, transportes públicos e taxis a uma curta distancia.